I was treating my ant-infested lawn one day when a novel idea hit me. 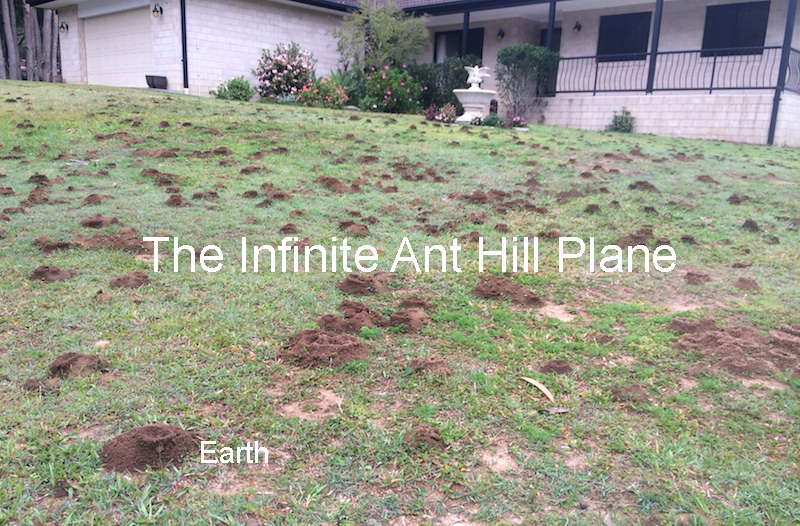 What if our Earth is like an ant hill in someone's lawn? The lawn is our particular flat plane universe and the many ant hills are the many "Earth's" on it, of which ours is only one. Since my neighbours also have lawns, these represent other flat plane universes separated artificially by a "fence". Whether these other universes also contain Earths or ant hills depends on how the owner(God of that universe) treats his lawn. All of the countless Earths or universes can connect from both the surface(when the weather is right) or from underground tunnels and passages(inner or hollow Earth). We are of course the ants, laboring and scavinging almost robotically, and thriving and multiplying until we become too numerous and start ruining the lawn owner's lawn, and sometines even get into the owner's house! That's when the Lawn Lord takes action and sprays us(chemtrails?) or sets up ant traps or baits(fema camps? ), etc. In this sense, the ant infestation scenario reflects the human overpopulation situation, only on a much smaller or tinier scale.